The consolidated financial statements cover the group of consolidated companies belonging to KION Holding 1 GmbH. As at the reporting date of 31 December 2012, KION Holding 1 GmbH indirectly held all shares in KION GROUP GmbH, which acts as the strategic management holding company and operational parent company of the KION Group (also referred to below as simply 'KION'). The number of shareholders increased in the year under review. In December 2012, the shareholders’ meeting of KION Holding 1 GmbH passed a resolution to increase the Company’s share capital. 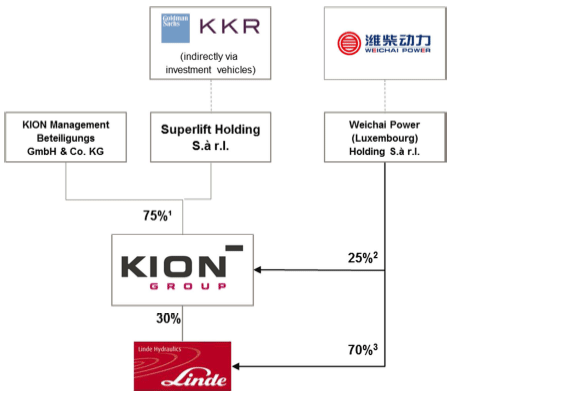 After the capital increase, Weichai Power Co., Ltd. (referred to below as 'Weichai Power') holds a 25 per cent share in KION Holding 1 GmbH through its subsidiary Weichai Power (Luxembourg) Holding S.à r.l. The contribution amount was paid by Weichai Power on 27 December 2012. The capital increase was entered in the commercial register in January 2013 (see ‘Events after the balance sheet date’). The remaining 75 per cent of the shares will be held on the one hand indirectly through investment vehicles and subsidiaries of former shareholders Goldman Sachs Capital Partners and KKR & Co. L.P., and on the other hand by an management participation company. The latter company manages about 5.7 per cent of the management holdings in KION Holding 1 GmbH. 3) Under certain conditions Weichai Power’s share in Linde Hydraulics can be increased further. The acquisition of shares by way of capital contributions made by Weichai Power further strengthened KION's capital structure. A detailed explanation can be found in the presentation of the financial position. Weichai Power has a call option vis-à-vis Superlift Holding S.à r.l. to acquire a further 3.3 per cent of the shares, which it can exercise before mid-2013 or, should KION be floated on the stock market in future, during the three months after flotation. Moreover, in the event of flotation on the stock market, Weichai Power can increase its equity investment (with full recognition of the resulting dilutive effects) to 33.3 per cent by means of a capital increase, if it previously held at least 28.3 per cent of the shares, or to 30.0 per cent, if it previously held less than 28.3 per cent of the shares. The acquisition of shares is part of a long-term strategic partnership between the individual companies of KION and Weichai Power, at the core of which is close cooperation in the field of industrial trucks and hydraulic drive technology (further details can be found in the section Strategy of the KION Group). Under the agreement, Weichai Power also acquired a 70 per cent controlling interest in Linde Hydraulics GmbH & Co. KG (referred to below as 'Linde Hydraulics') with effect from 27 December 2012. The majority of the former hydraulics business of Linde Material Handling GmbH (referred to below as 'LMH GmbH') was transferred into this company. LMH GmbH continues to hold the remaining 30 per cent as a strategic investment. Weichai Power’s share in Linde Hydraulics can be increased further under certain conditions (see note 6). KION is represented in the market by two global brands – Linde and STILL – and four regional brands: Fenwick (France), OM-STILL (Italy), Baoli (China and other emerging markets) and Voltas MH (India). While the brand companies have full operational and commercial responsibility within their particular markets, KION GROUP GmbH acts as a strategic management holding company and is responsible for the cross-brand Group strategy as well as for key Group functions, for which it defines group-wide business standards. For internal management purposes, KION has divided its business into operating segments that correspond to the reportable segments required by international financial reporting standards (IFRS 8). KION changed this segment structure in 2012, after having already put in place the structures required from an organisational and company law perspective to manage and show the financial services activities of the Group separately in 2012. These are now aggregated in the Financial Services segment. The figures for 2012 and 2011 have been reported in accordance with the revised segment structure as shown below. The Linde Material Handling (LMH) segment encompasses the Linde, Fenwick and Baoli brands. The hydraulics business was also part of the LMH segment until KION sold its majority stake in Linde Hydraulics on 27 December 2012. Linde Hydraulics is recognised as an affiliated company in the consolidated financial statements (using the equity method). The STILL segment comprises the STILL and OM-STILL brands. Spare parts business and service form an integral part of the LMH and STILL segments and complement their product portfolios. However, financing business, which promotes sales, is assigned to the new Financial Services (FS) segment. The Other segment essentially consists of internal activities relating to IT and logistics as well as the group holding activities of the KION Group. The Voltas MH brand is also assigned to the Other segment. KION follows generally accepted standards of sound, responsible corporate governance. The German Corporate Governance Code (DCGK) provides the framework for management and control structures and procedures. Further information about corporate governance at KION is available on the Company's website (www.kiongroup.com). Gordon Riske, Chief Executive Officer (CEO), is responsible for strategy, communications, governance and compliance, market intelligence and the Group's Asian business. Dr Thomas Toepfer was appointed to the Executive Board in the role of Chief Financial Officer (CFO) with effect from 1 September 2012. He is in charge of finance, the FS segment, IT activities, mergers & acquisitions and investor relations. He replaced Harald Pinger, who left at his own request on 31 August 2012. Until his departure at the end of 2012, Otmar Hauck was Chief Operating Officer (COO) and was responsible for quality, central operations, purchasing, logistics and product development in the Group. No new COO was appointed for KION GROUP GmbH. After Mr Hauck left, responsibility for purchasing passed to Dr Thomas Toepfer, while CEO Gordon Riske took charge of KION Warehouse Systems. Until his retirement on 11 January 2013, Klaus Hofer was responsible for human resources, legal affairs, health & safety and internal audit, and was also KION's Labour Relations Director. His responsibilities have been transferred to Gordon Riske and Dr Thomas Toepfer. The Executive Board was expanded in January 2013 in response to the growing significance of business in Asia and to make the management of the Linde and STILL brands more involved in running the Group as a whole (see 'Events after the balance sheet date',). The Executive Board maintains a relationship of trust with, and is monitored by, the Company's Supervisory Board. The Supervisory Board consists of six shareholder representatives, who are chosen by the shareholders' meeting, and six employee representatives. It advises the Executive Board in its handling of significant matters and business transactions. The Supervisory Board has created a Human Resources Committee and an Audit Committee to increase the efficiency of its work. It also has an Arbitration Committee pursuant to section 27 (3) German Codetermination Act (MitbestG), which meets if required to do so in circumstances specified by law or by the memorandum and articles of association. The composition of the Supervisory Board is described in note 44. In the year under review the remuneration paid to the Executive Board comprised a fixed salary and non-cash benefits (including pension entitlements) and performance-related components. The basic principles of the remuneration structure and the total amounts paid to the members of the Executive Board and Supervisory Board are set out in the notes to the consolidated financial statements (note 43).